As a group take turns to read each paragraph from the text. Help each other out if you get stuck! Once you have finished reading the text discuss the questions (below) as a group. Present your answers in any format you wish. Mindnode and Keynote may be a good choice. There are 2 sides to this argument. 2. Find evidence to show how the editor supports the "for" arguments. 3. 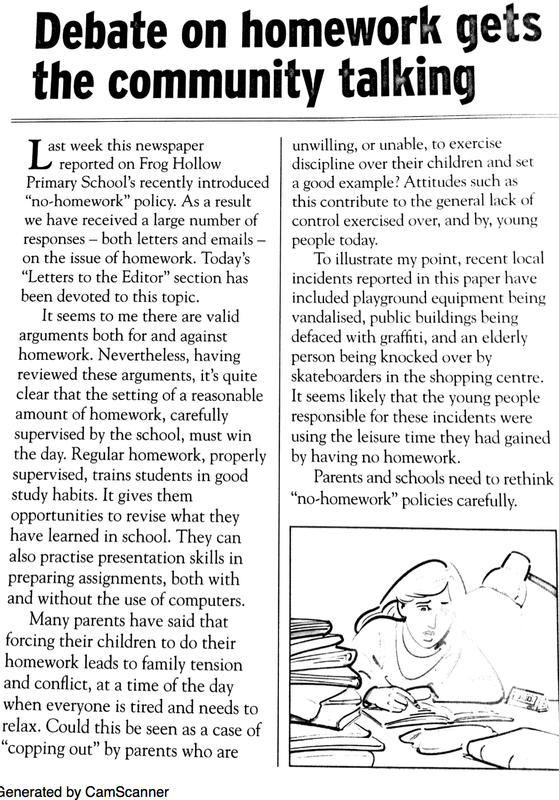 The Editor is biased against the view that homework is not necessary in primary schools. Find six words or phrases that the editor has deliberately chosen the sway the opinions of others. 4. The letters to the Editor show varying degrees of bias for and against homework. Some letters offer no arguments to support their point of view. Identify the letters that fit the categories below, and list the arguments or the language that they use to persuade the reader.